Fold-out pages for longer compositions! 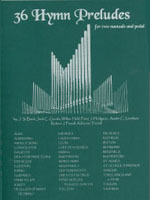 Preludes by J. S. Bach (“Jesu, Joy”), Wilbur Held (1), Jack C. Goode (5), Peter J. Hodgson (4), Austin C. Lovelace (11), Robert J. Powell (5), Adrienne Tindall (9). Based on Alma, Almsgiving, Angels’ Song, Consolator, Dalkeith, Den Store Hvide Flokk, Ebenezer, Egerton, Ewing, Guidance, Hymn to Joy, “Jesu, Joy” (Werde Munter), Kremser, Lauda Anima, Leoni, Lobe den Herren, Manna, Martyrdom, Morecambe, Nun Danket, Old Hundredth, Orientis Partibus, Påskemorgen Slukker Sorgen, Pollstin, Presence, Rathbun, Repton, Rest, Ridgeville, Rutherford, St. Agnes, St. George’s Windsor, Saviour,”Three Kings and a Star”, Toulon, Valerius.